From gorditas to arepas to empanadas, nearly every Latin American country has its version of fried corn dough stuffed with savory goodies. Enter the pupusa – El Salvador’s take on the traditional ingredients of corn masa, cheese and meat. These fried corn cakes come with a variety of fillings and offer oozy, cheesy goodness in every bite. And they are the proverbial bread and butter of Elio Flores and Celina Ramos’ restaurant, El Pulgarcito, which has been bringing the traditional food of El Salvador to the Puget Sound for over 12 years. 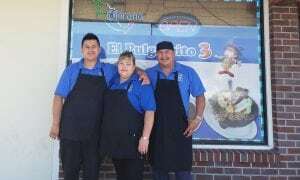 Elio and his wife Celina first opened El Pulgarcito in January of 2006. Before starting their own business, Elio spent six years working as a dishwasher and running a small store with a family member. After a year or two, they had the idea to install a pupuseria, and El Pulgarcito was born. Named for El Salvador’s popular moniker (el pulgarcito literally translates as “the little thumb,” which references both the country’s shape and the fact that it’s the smallest in Central America), their first operation was located off Pacific Highway. It didn’t take long for the word to spread and demand to grow throughout the South Sound. Within two years, Elio and Celina were able to plant a second location in Lacey, and in 2014 they opened a third restaurant in Lakewood’s historic International District. Running three restaurants keeps the couple busy, but their enterprises have grown with the help of their children and extended family. And each location features the same menu of classic Salvadoran plates. The food at El Pulgarcito consists of beloved national dishes ranging in size and scope. Try the sweet fried plantains with beans and crema (like sour cream that got an upgrade – smoother, creamier, and less tangy). Or grab a heartier option like sopa de pata (traditional tripe stew with yucca and zucchini) or pollo guisado (stewed chicken with rice, beans, and tortillas). With an impressive array of soups, meats and seafood, there’s no shortage of options to eat your way through. Beyond traditional Salvadoran fare, Elio and Celina have included a few dishes with other influences. 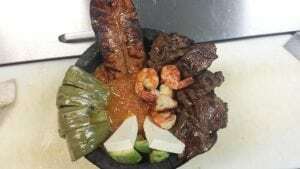 For something different, they recommend the molcajete. Elio explains, “It’s a very typical Mexican dish, but we’ve given it our own touch.” The meal, which starts with a nopal and is layered with carne asada, chorizo, cheese, and avocado, is a showstopper that can easily feed two. Tacos, burritos, and quesadillas are available as well. But the main event at El Pulgarcito are the pupusas. Each corn cake is hand-shaped, filled, and fried to perfection, then served with a side of curtido – thinly sliced cabbage seasoned with vinegar, salt, carrots, and chile – homemade salsa and an optional helping of beans and rice. To create them, start with a ball of corn dough then add the fillings of your choice. Then seal, reshape, and carefully flatten them into a perfect circle. And rinse and repeat. El Pulgarcito serves seven varieties of pupusas, available in combination dishes or as a stand-alone meal. A crowd favorite are the pupusas revueltas, which are filled with a trifecta of chicharron (fried pork), beans and cheese. 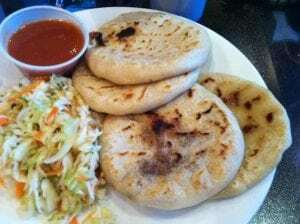 Veggie lovers can order pupusas stuffed with zucchini and cheese or the traditional loroco flower with cheese. And chile aficionados can enjoy the recently added the pupusa ahogada – pupusas drowned in beans and a spicy salsa. For those looking to appreciate authentic Salvadoran cuisine, El Pulgarcito is an excellent choice. Stop by one of their two locations in Lakewood at 12134 Pacific Highway SW and 8534 S Tacoma Way SE, or in Lacey at 4509 Lacey Boulevard SE. For more information, check out their Facebook page.